Worry. It consumes me at almost all times. I don’t want it to but I don’t know how to stop it either. The email had sat in my inbox for months. The email that I knew I needed to reply to and yet I never seemed to know what to say. Deciding to take a break from something you love is hard enough but running the risk of simultaneously disappointing people you care about can take you to the breaking point. I worry about a lot of things: work, my relationship, my friends and family. I keep a busy life to help me with this worry. The way I see it, if I don’t have time to worry, then I won’t. Writing has helped immensely; not only keeping me busy but allowing me to vent this worry to the world. A main outlet has also been dance. Dance has brought some stress, but little worry, to my life. The happiness it gives me more than makes up for any stressful nights and I had suddenly decided to take a break from it. Was I crazy? The worry I felt every time I opened my inbox was becoming tiresome. I had known people to take breaks from dance but had never returned. That wasn’t me. I know I’ll return in the Fall. I have to return in order to keep my sanity. The problem here was my worry that they wouldn’t understand; that they would be disappointed or feel a lack of commitment that I couldn’t make it the whole year. I didn’t want to come back in the Fall wondering if they thought I was the slacker that I felt I was. Seem irrational? Perhaps. How was I to know? I’m a worrier. These people are not just fellow dancers to me. They are my friends and my family; a new family that I have created over the past two years. You never want to disappoint your family. It is one of my biggest fears. So I sat on the email for months, drafting, deleting, re-drafting, etc. It never came out right. Then, it happened. I don’t know how and I don’t why. I stopped worrying. I like to think that maybe Bobby McFerrin came to me in a dream and sang me a little diddy. Maybe it was my writing. Whatever it was, I knew I had to stop. I found a great quote today that stated, “Worry does not empty tomorrow of its troubles; it empties today of its strength” (Corrie ten Boom). I stopped worrying for ten minutes to write the email I had been attempting to draft for months and finally hit send. Some things in life deserve worry but it shouldn’t consume your being like it has with me. A lot of worry only happens because you care. I cared about these people so much and I couldn’t bear the thought of being any sort of disappointment to them. The funny thing is, when it comes to people who care about each other, you shouldn’t have anything to worry about. I literally start worrying the minute my eyeballs open in the morning and don’t sto until I pass out at night…. Same here – I’m trying to be better but then I just find new things to worry about!! That’s true–when it comes to people you care about, you shouldn’t have to worry. But sometimes because we care, those are the relationships we worry most about, so it makes total sense. Agreed – Eventually, you have to tell yourself to stop. I, of course, ended up having norhing to worry about. They always understand! I know how you feel. Sometimes I think that there is nothing so insignificant that it will escape my worrying about it. I’m getting better about not sweating the small stuff especially trying not to worry about people who I know don’t worry about me. I was waiting for that…. Argggghhhh so predictably awesomely bitter. That anticipatory worrying is hell! I’ve had emails sitting in my inbox for months too. But once you finally do deal with them and send the reply, it’s amazing how much better and lighter you feel, isn’t it? Oh for sure — But then ten more come in right after it and it’s back to square one! I need wine. Is it 5:00 yet? I’ve wasted a lot of time on worry, so this post was easy to relate to. You really captured the feeling of it here. Also, I’m pretty sure I will be singing this song all week. Great post! Thanks for reading! Loved yours as well. 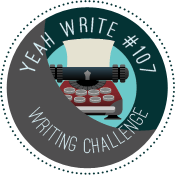 I’m losing my virginity on Yeah Write this week and it’s great to find new blogs! Well, welcome to the YW community! It is so nice to meet you. Last week was my first week back in a while, but it is such a great place to meet new people, and I think my writing has improved since I started linking there (especially since they’ve cut the word count limits). Haha — Thanks so much! I’m loving the blog community 🙂 Everyone is so great! Ah, yes! The ol’ “I don’t want to check my email” trick . . . . it will get you every time. Unfortunately, I’m one of those people who can’t stop checking her email so it’s a constant torture until I just say ‘F*$# IT! !’ and respond…. I get this. I have some things that will worry me and I’ll let them keep bugging me and I’ll just keep worrying. I know. So you tell yourself to stop but you can’t. It’s my never-ending cycle! I’m a giant ball of worry and anxiety. Oy! I need to think about Bobby McF from time to time too. I’m so weary from worrying that I’ve crossed the line and don’t give a dang anymore. At least for now. I think that sometimes … But it doesn’t take long before I’m right back where I was!